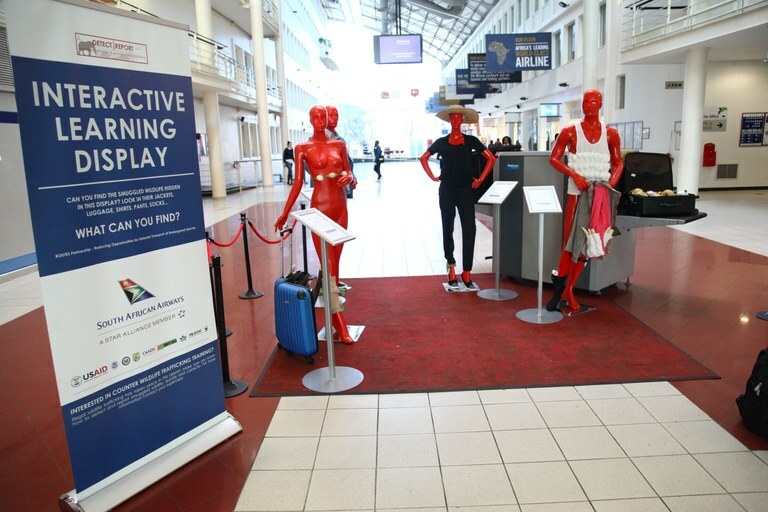 The USAID Reducing Opportunities for Unlawful Transport of Endangered Species (ROUTES) Partnership worked with South African Airways to unveil a life-size wildlife trafficking awareness installation at the staff lounge in Johannesburg’s O.R. Tambo International Airport. The new installation features staged mannequins, customized posters, and informational materials that spotlight wildlife trafficking and provide guidance on how staff can help identify and stop wildlife traffickers from abusing the air transport sector. The awareness materials – developed and installed under the ROUTES Partnership by Freeland with support from TRAFFIC and the International Air Transport Association (IATA) – reinforce lessons and data from a wildlife trafficking prevention training provided to South African Airways staff and conducted by ROUTES last September. According to a recent ROUTES report, Flying Under the Radar: Wildlife Trafficking in the Air Transport Sector, South Africa serves as a hotspot for poachers and traffickers supplying wildlife and wildlife products to Asia. Rhino horn, in particular, is commonly smuggled through O.R. Tambo International Airport in Johannesburg. South Africa hosts the largest population of rhinos in the world, but estimates suggest that every eight hours a rhino is killed in the country for its horn, precipitating a species conservation crisis.